Newark, New Jersey: Governor Chris Christie came to Newark's Central Ward on Friday afternoon as part of National Reentry Week. Christie met at the Greater Newark Conservancy on Prince Street with former governor Jim McGreevey and several former inmates at New Jersey state prisons, including one who served his sentence at Northern State Prison in Newark. Christie, who was introduced by McGreevey, spoke about topics such as drug courts, bail reform, recidivism, 'banning the box' on job applications, and the state of New Jersey's state prisons. At the same time, Senator Cory Booker and U.S. Attorney Paul Fishman spoke at Federal Square across town about prisoner reentry as well. This photo shows the 'ghost sign' for the Newark Sunday Call on Halsey Street. The paper published from 1872 to 1946. Newark, New Jersey: Several current and former politicians and leaders will gather in Newark tomorrow for two separate events regarding prisoner reentry. Governor Chris Christie and former Governor Jim McGreevey will meet at the Greater Newark Conservancy on Prince Street for a roundtable discussion with clients of the New Jersey Reentry Corporation. Governor Christie will address prisoner reentry following the meeting. Meanwhile, across town, Senator Cory Booker and U.S. Attorney Paul Fishman will speak at the Frank R. Lautenberg Post Office and Courthouse at Federal Square as part of the ReNew Court graduation. According to the United States Department of Justice, the ReNew Court is "a partnership among the U.S. District Court, the U.S. Attorney’s Office, the Federal Public Defender’s Office, and the U.S. Probation Office designed to help ex-offenders recently released from federal custody successfully reintegrate into society" in Newark. Both events will begin at 3:00pm, and fall during National Reentry Week. Newark, New Jersey: Halsey Street in Downtown Newark will soon have another new business. Krauszer's, one of Essex County's largest convenience store chains, will open a location at 127 Halsey Street, at the corner of Raymond Boulevard. The chain has locations in New Jersey, New York, and Connecticut, and opened a location on Market Street in the RockPlaza Lofts development in 2015. Another store is also proposed for the Teachers Village complex further south on Halsey Street. 127 Halsey Street is currently undergoing a renovation to become a mixed use development with 16 residential units. The Harvest Table restaurant will remain open, while other retailers in the building have closed. This photo shows the abandoned Essex County Jail near the Newark Light Rail's Norfolk Street Station. South Orange, New Jersey: A location of a pet food store chain is opening in Downtown South Orange. A franchise of Pet Wants will be located at 67 South Orange Avenue, between Vose Avenue and Scotland Road. The business will be owned by resident Bob Zuckerman, who is also the Executive Director of the South Orange Village Center Alliance. It will sell dog food and cat food, and offer free delivery. Pet Wants of South Orange, which is expected to open by Memorial Day, will be the company's first New Jersey location. There are currently stores in Ohio, Indiana, Texas, Maryland, Kentucky, North Carolina, Florida, and Pennsylvania. The space was previously occupied by the South Orange Jewelry and Art Exchange, Robyn Ross, and Gio Tech. South Orange currently has one other pet store, Zen Pets, on Valley Street. Livingston, New Jersey: A vacant lot in Western Essex County could soon be redeveloped. According to a legal notice from the Township of Livingston, a car wash and detail center are proposed for 395 West Northfield Road in Livingston. The lot is located at the Livingston Circle along Route 10/Mount Pleasant Avenue near Eisenhower Parkway. Livingston Car Wash, which is currently located near Eppes Essen at 111 East Mount Pleasant Avenue, is listed as the site redeveloper. A gas station called Circle Service Station used to stand at the property. The Route 10 corridor in Livingston and East Hanover, Morris County has seen significant changes recently. The Village at Livingston Shopping Plaza recently rebranded as The Shoppes at Livingston Circle, and now contains The Fresh Market, a bagel shop, and other retailers, and a Dunkin Donuts and Bassett Furniture opened in the Circle Plaza in 2015. In addition, the site of the former Margarita's Mexican Restaurant and Houlihan's Restaurant will be redeveloped into The Corner at Livingston Circle, which will contain locations of The Container Store, Shake Shack, Starbucks Coffee, and Blaze Pizza. Unionville Vineyards, a winery in East Amwell Township, Hunterdon County, has applied to the New Jersey Division of Alcoholic Beverage Control for a wine retail outlet license for the former Cosi space at 471 Route 10. This photo shows the Rutgers-Newark clock tower with the former Bamberger's building in the distance. This photo was taken outside of the Veterans Administration Federal Building at the corner of Washington Place and Halsey Street in Newark. The building dates to 1920. South Orange, New Jersey: Volunteers are needed to help clean up an Essex County park this weekend. 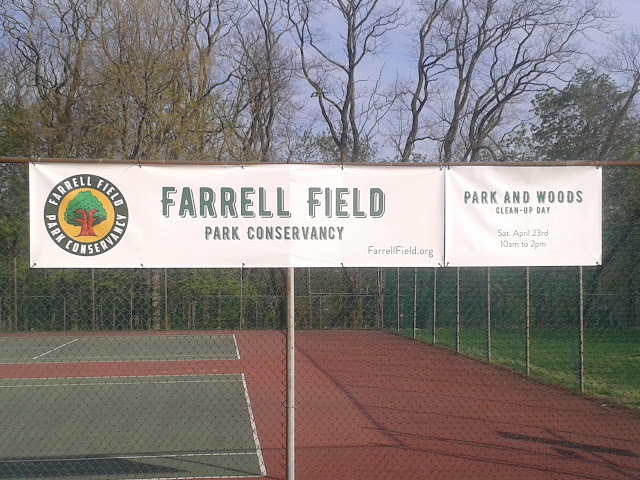 The Park and Woods Clean-Up Day will be held this Saturday, April 23rd, at Farrell Field in South Orange. According to the Farrell Field Park Conservancy, which is sponsoring the event, attendees will remove litter and debris from the field and the wooded area behind it from 10:00am to 2:00pm. Farrell Field is located on Walton Avenue between Lenox Avenue and Audley Street. The removal of litter is not the only change coming to the area surrounding the park. NJ American Water is continuing construction on a new water pumping station near the road to the South Orange Department of Public Works, and CrossFit studio Run Jump Lift is opening a temporary location inside the former Jersey Animal Coalition shelter, which has been vacant for nearly a year and a half. This photo shows one of the original Lackawanna Railroad mile markers, which is still standing near the South Orange Train Station. These photos show the Washington Street Station on the Newark Light Rail. This photo shows the clock tower at the Newark Broad Street Station. Orange, New Jersey: Two houses in Orange's Seven Oaks neighborhood that date to the 19th century could be torn down, but another could be renovated. According to a legal notice, the Orange Township Board of Education (BOE) is planning to renovate 366 Clarendon Place, a house located opposite Orange High School between Lincoln Avenue and Carteret Place. The house dates to 1881, and according to Orange Township BOE meeting minutes, the building will be used as part of an expansion of the high school. One person was shot and killed and another was injured in the house in 2006, according to News 12 New Jersey. However, the application also calls for tearing down 386 and 396 Clarendon Place to make way for 94 parking spaces. The houses date to 1839 and 1849, respectively. The Orange Township BOE paid $87,500 for 386 Clarendon Place and $192,500 for 396 Clarendon Place in 2013. 386 Clarendon Place is on the New Jersey Register of Historic Places. The application will be heard at the next meeting of the Orange Zoning Board of Adjustment of Wednesday, April 27 at City Hall. This is not the only upcoming plan for Orange schools. The Orange Township BOE is purchasing the former Marylawn of the Oranges School just over the border in South Orange for use as a STEM (Science, Technology, Engineering, and Math) high school. The building has been vacant since 2011. East Orange, New Jersey: Another new development is coming to the City of East Orange. According to the City, a groundbreaking ceremony will be held on Wednesday, April 20th for a new building at 742 Park Avenue, between Park Street and Washington Street. The site, located one block from the Orange border, is currently a vacant tract, and faces Washington Street as well. According to Mayor Lester E. Taylor III, the new development will contain 26 residential units. The area is served by NJ Transit's 41 and 97 buses, and is less than a mile from the Orange and Brick Church Train Stations. Newark, New Jersey: A possible extension of the PATH train through Newark could be years away, but development of a new mural along the tracks is beginning soon. According to the Newark Downtown District, the District, the City of Newark, and the Newark Community Economic Development Corporation will partner with local and international airports and Sherwin-Williams to create the second largest mural in the country. The mural will be located along the wall on McCarter Highway/Route 21 next to the tracks used by NJ Transit, Amtrak, and PATH just south of Newark Penn Station. In addition, murals could also be coming to two train stations along the Morris and Essex NJ Transit line. The South Orange Performing Arts Center and the Valley Arts District are applying for a grant to install murals under the South Orange Train Station and at the Highland Avenue Train Station in Orange. This photo shows the former Second Presbyterian Church on Washington Street in Newark. Audible will open an engineering and development hub inside the church and in two neighboring buildings. This photo shows Rutgers-Newark's 15 Washington Street building. Newark, New Jersey: The City of Newark and Uber have just reached a tentative agreement, according to a statement from Mayor Ras J. Baraka. The statement says that the agreement "will keep UBER in Newark, protect the business interests of the taxi and limousine industry and provide a boost to the city’s economic development and leadership in technology". Baraka's announcement comes after proposed legislation by the Newark City Council to regulate ride-sharing services like Lyft and Uber. The city sent an email to residents on Friday morning titled "Uber Falsehoods", reading that "Uber is spending over $1,000,000 on advertising to deceive people. We need your help to get the truth out." Uber created a website this week called BarakaBan.com, but the content on the site has since been removed. “We are pleased that we reached a tentative agreement with Mayor Baraka. We look forward to continuing to provide transportation options and economic opportunity to Newark and its citizens", Uber spokesperson Craig Ewer told Essex County Place. This photo shows the Cathedral Basilica of the Sacred Heart near Branch Brook Park in Newark.